Climbing terminator robots; flaky electronics; 2D crystal materials. Simon Fraser University has developed a family of climbing robots that mimic the stickiness of gecko lizard feet. Based on a “footpad terminator” adhesive technology, the robots could be used in space missions and on Earth. 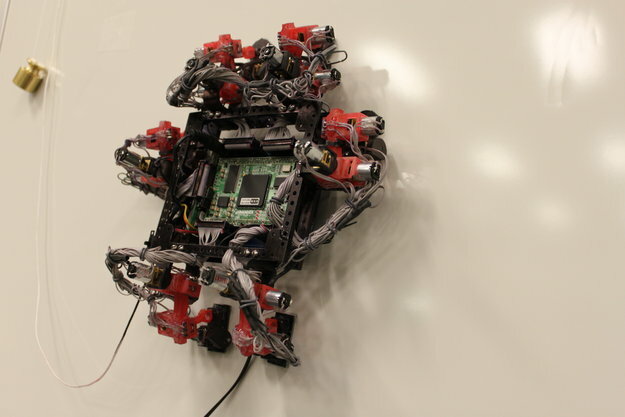 The climbing robot, called Abigaille, features six legs. This allows the robots to crawl on vertical and horizontal structures. The technology could one day lead to the development of “hull-crawling automatons,” which could repair and tend to spaceships during flights. A video of the robot can be seen here. The robots could be used for other applications, such as servicing satellites and cleaning high rises. Researchers are also developing interactive wearable robotic devices. This is for those who have lost control of their arms and hands due to injury. The robots were recently tested at the European Space Agency (ESA). Researchers were inspired by geckos, which have tiny adhesive hairs on the bottom of their feet. As a result, researchers have developed gecko-inspired dry adhesive materials that could withstand space vacuums and temperatures. There are several challenges to develop this technology. Climbing robots are required to preload their feet against the wall, causing a redistribution of force in the entire robot. An inappropriate force could cause the robot to fall from the vertical surface. Two next-generation technologies–carbon nanotubes and graphene—are promising for future chip applications. But one emerging technology—molybdenum disulfide—could have more potential than carbon nanotubes and graphene. The National University of Singapore (NUS) has developed a method to exfoliate molybdenum disulfide crystals into monolayer flakes. The flakes can be made into a printable solution, which can be used in printable photonics and electronics. a.) Bulk molybdenum disulfide crystal was expanded by decomposition of hydrazine. b.) 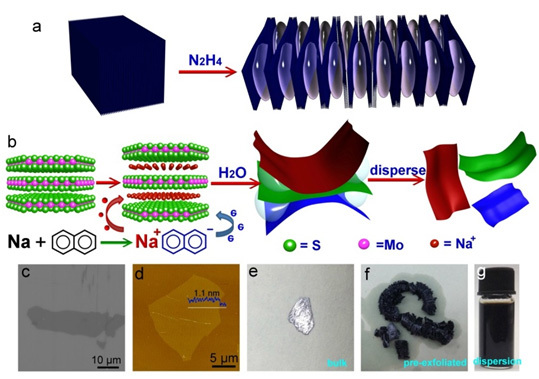 The expanded molybdenum disulfide reacted with sodium naphthalenide to form an intercalation sample, then exfoliated into single layer sheets by immersing in water. c.) Scanning electron microscopy image of single layer molybdenum disulfide on silicon dioxide. d.) Atomic force microscopy image of single layer molybdenum disulfide on silicon dioxide. e.) Photograph of bulk single crystal molybdenum disulphide. f.) Photograph of pre-exfoliated molybdenum disulphide. g.) Photograph of sodium-exfoliated single layer molybdenum disulfide dispersion in water. Molybdenum disulfide is a chalcogenide compound, which is gaining attention due to its electronic and optical properties. But making single layer chalcogenides is a long process and the yield is poor. To address the problem, NUS prepared naphthalenide adducts of lithium, sodium and potassium. Then, researchers compared the exfoliation efficiency and quality of molybdenum disulfide generated. Using a two-step process, researchers produced single-layer molybdenum disulfide sheets with large flake sizes at good yields. Researchers also demonstrated that the flakes can be made into a printable solution, making it ideal for inkjet printing. This, in turn, could enable the development of printed photonics, electronics and optoelectronics. “At present, there is a bottleneck in the development of solution-processed two dimensional chalcogenides. Our team has developed an alternative exfoliating agent using the organic salts of naphthalene and this new method is more efficient than previous solution-based methods. It can also be applied to other classes of two-dimensional chalcogenides,” said Loh Kian Ping, a professor at NUS, on the university’s Web site. Two-dimensional crystal semiconductors are getting some attention in the semiconductor industry. These 2D materials include graphene, boron nitride (BN) and the transition-metal dichalcogenides (TMDs). These next-generation materials are thinner than today’s technology. As a result, 2D crystal materials could be used to help scale future FET structures, according to a paper at the recent IEEE International Electron Devices Meeting (IEDM) in Washington, D.C. The co-authors of the paper were IBM, Samsung, the University of Notre Dame, Carnegie Mellon, the University of Tennessee, and the University of California at Santa Barbara. One of the challenges for future FETs is the channel region. Traditional materials could be used, but it’s unclear if they will scale. One possible application is the development of a TMD-based channel FET. TMDs channel FETs show promising switching capabilities, but there are some challenges. The challenges include material growth, controlled doping, and the development of low-resistance contacts. Another application for 2D crystal semiconductors is the tunnel field-effect transistor (TFET). Aimed for the 5nm node, the TFET is similar to today’s MOSFETs, but the TFET is a gated-diode that makes use of an electron tunneling technology. TFETs are aimed to beat the Boltzmann limit of 60 mV/decade.